The big flavours of this veggie-packed soup will fill you up while you count down to your office party dinner. 2. Place the peppers and sweet potatoes on a large baking sheet and drizzle with 2 tablespoons of the olive oil. Roast in the oven for 20 to 25 minutes, tossing halfway through, until the peppers are charred and the sweet potatoes are almost cooked through. 4. Bring to the boil, then reduce the heat and simmer for 20 to 25 minutes, until the soup has reduced slightly and the vegetables are fully cooked. Blend until smooth and season to taste. 5. 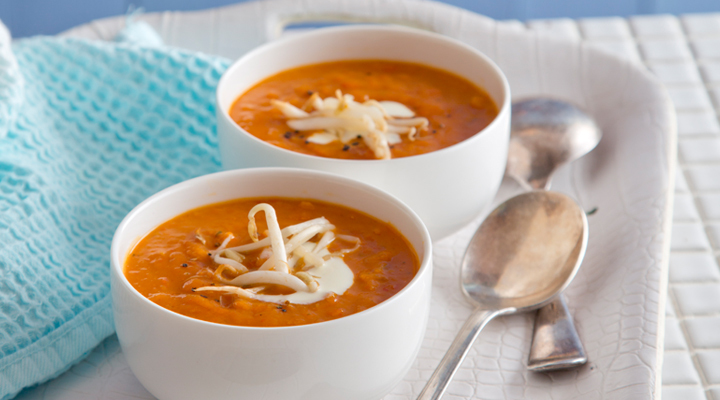 To serve, ladle the soup into bowls, drizzle with crème fraîche and sprinkle with beansprouts and some chilli flakes.